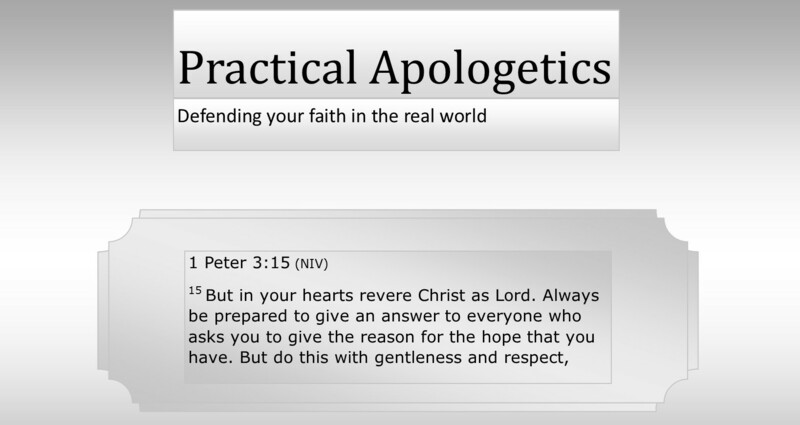 Welcome to the first topic of what I hope will be a series of articles on “Practical Apologetics.” This series is not intended to be any sort of a scholarly work. Its goal is to be a source of practical application for the layman in simple articles that can be easily digested. To prepare against the hit pieces making their way through the various documentary channels (especially since it is Christmas season as I write), this first article addresses a favorite attack made against Christians; the reliability of the Bible. Frankly, I find it amazing that biblical reliability is even a direction of attack any more. There have been so many books, archeological findings and academic papers written on the subject that one would think the subject closed. Sadly, far too few Christian leaders have taken the effort to train people in defending even the most basic attack. For me, the difficulty is not in defending scripture but that there is so much information that it can be difficult to avoid overwhelming the student. Hopefully, I can find that middle ground of useful information without glazing over people’s eyes. The preservation of the original manuscripts. The authorship of the books of the Bible. What books make up, or should make up, the Bible. There are certainly many other areas of attack, but these have been the most common in my experience. I will take each of these topics as a single article. In this first article we will discuss the preservation of the Bible through history. The obvious issue on the preservation of the Bible is that it was originally written a very long time ago. So long ago that we no longer have the original copies by the original authors. All we have to go from are copies of copies that were made long after the originals. There is the additional problem that all of these copies were done by hand. It’s not difficult to see that a lot of errors could have slipped in between the time that the words were first written and the copy that is in our hands on Sunday at church. Attacks against the Bible almost always start with the question of, “How do we know the Bible we have today accurately reflects what was written thousands of years ago?” Asked in an honest manner, this is actually an excellent questions; one every Christian should be able to answer. How do we know if today’s texts reflect the originals? Can we know this with any sense of certainty? The answer is an easy, “Yes.” And for many reasons. For the Old Testament, archeology and Jewish reverence of scripture have come to our assistance. The Jewish priesthood was meticulous in its method of preserving scripture. In the last 100 years, especially, archeological finds have been able to test how well the Jews did in this preservation. To copy scripture, Jewish scribes had very strict rules. Some of these rules involved aspects of ritual bathing for purification or special rules in writing the name of God (YWYH). There were rules governing the types of inks and scrolls used. Rules such as these, not only showed a reverence to God, but also placed the copyist in a mindset that encouraged accuracy of his work. Other rules were specific to ensuring an accurate copy. Scrolls had to be a specific size so that, for example, the last line of the Torah would be on the last line of the scroll. There were strict rules on both line and letter spacing. Copyists were not allowed to copy from memory and repeated the words aloud as they worked. Touch, vision and sound all worked together to prevent mistakes. Any mistake on the page made during the copying resulted in the entire page being destroyed and the scribe starting over. Three such mistakes on the scroll and the entire scroll was destroyed. Perhaps the most fascinating rule for me was that every letter had a numeric value. Once completed, the text would be counted, not just to see if the word totals and character totals was correct, but the scribe would also verify that the total of the values of the characters were correct. This type of check is a method that computer programmers use today to ensure that files have been copied correctly. Do we have any evidence as to how well these precautions worked? After all, the copying was done by imperfect humans over the course of many centuries, so errors could have slipped in. To make it even more challenging, for a long time our oldest complete Hebrew Old Testament (called the Masoretic Text) dated back only to the 10th century (i.e. 900 A.D.). Yes! The way came about beginning in 1946. This was the year a young shepherd boy discovered what would become known as the Dead Sea Scrolls. Dating the various scrolls put their age between 200 B.C. to 1 A.D. We now have a source 1000 years older against which we can compare our copies. This also brings us 500 years or closer to the original manuscripts by the God-inspired authors. The scrolls include all or parts of all but one of the books of the Old Testament. Only the book of Esther is missing. So how does the comparison fare? The comparisons were extremely accurate. One of the great Bible scholars of the 20th century, Gleason Archer, described it as, “Even though the two copies of Isaiah discovered in Qumran Cave 1 near the Dead Sea in 1947 were a thousand years earlier than the oldest dated manuscripts previously known (A.D. 980), they proved to be word for word identical with our standard Hebrew Bible in more than 95 percent of the test. The five percent of variation consisted chiefly of obvious slops of the pen and variations in spelling.” More important, there are no doctrinal changes in any of the variations of the texts. Again, this is but one example. The study of the Dead Sea Scrolls, however, has given a consistent message of the accuracy of the Old Testament. Notice that the time gap is huge, often a thousand years and more, between the time the books were written and the earliest copies (or partial copies) that still exist. It is also important to notice that there is typically only a handful of copies. Yet we consider these works accurately persevered. This is only a sampling, too. If you look into this on your own you will find this trend repeated over and over. I should point out that the earliest complete copy is dated around the 10th century (i.e. 900 A.D.) which is a gap of approximately 1,700 years. Nevertheless, with the sheer number of copies available, I doubt that anyone would question whether The Iliad has been accurately preserved. To answer the most obvious question; no, the number of copies is not an error. There are more than five thousand, six hundred copies and partial copies of the New Testament books available, with the oldest complete New Testament only 325 years after the various books and letters that make up the New Testament were written. Ok, I am not being entirely accurate here. That’s 5,600 copies in Greek, the original language in which the New Testament books were written. The New Testament was translated into other languages in the ancient world. Often. If you include translations into languages like Latin, Syraic, Arabaic, etc. then the number of copies increases to more than 25,000! But not only is it well preserved, there is a strong case for it being preserved accurately. The simple fact that the earliest copies has such a short gap in time from the originals means that there is far less likelihood of error. The incredible number of copies allow us to cross-reference the text and further filter out any possible errors. Closely related to this, we can use the many translations to also cross-check accuracy. There is still another check we can make on the New Testament. Not only do we have the many copies, but we find extensive quotes from the New Testament in letters by the early church fathers. Obviously, these are not as good as going back to primary copies. Just like us, early writers may have used paraphrases or inexact quotes. Still, they are worth looking at from the perspective of strengthening our case. According to theologian Norman Geisler, there are more than 36,000 citations from New Testament scripture that date prior to the first Council of Nicaea in 335 A.D. In fact, the quotations are so extensive that we could accurately reconstruct the entire New Testament. Again, I would caution people that this is not so much an argument to establish accuracy but to help confirm it. The bottom line is that the New Testament books were originally written very close to the date of the events. This is clear from the dates of our earliest copies and we will discuss this further when we talk about the authors of the books and which books belong in the New Testament. The gap between events is very short compared to any other ancient work of history. As we see later this degree of preservation will play a role in establishing the accuracy of the events recorded. In parts two and three, we will take a look at some of these arguments. To conclude, I would strongly urge readers to investigate these matters on their own. In this paper, I have tried to keep the information at a simpler level to help people new to the subject. There are many more – and much more advanced – resources on this subject available.